This weekend PokerStars' seventh anniversary Sunday Million became the third largest tournament ever with almost 50,000 players all looking to win the lion’s share of the$7 million prize pool. 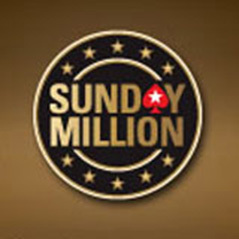 The 327th incarnation of the Sunday Million attracted a host of notable online players as well as 11,748 satellite qualifiers and when registration finally closed, the 49,287 players had pushed the prizepool to $9,857,400. By the time the masses had been whittled down to a final table of nine it was a case of all-in or fold for the majority of the table thanks to the high blinds and shallow stacks. With chips flying it was Germany’s “Kasra84” who scored a succession of eliminations to move into second place with just three players left. At this point the prospect of a deal was first mentioned before the tournament was paused to run the numbers. After some quick calculations behind the scenes the three remaining players were given the numbers. With $140,000 and a prize of over $700,000 for each player each typed “I agree” before play was restarted. At this point it was “Kasra84” who lost his momentum and hit the rail before the UK’s Steve “sexygee” Gent went the same way. Despite holding off Lithuania’s “benislovas” for a while, the Brit eventually lost the remainder of his chips to his opponent. With that “benislovas” became the champion and picked up a total of $848,589.